In the year 536 CE, a volcano erupted in El Salvador. What happened next is fiercely debated, but one hypothesis is that it lead to an extensive but short-lived climate change that was felt across the northern hemisphere. In Northern Europe it was felt as a string of poor summers and failed harvests. Numerous Roman sources describe the sun as dark during the day and according to the 6th century Syriac Chronical written by the Zachariah of Mitylene from Greece, there was "great despair among the people." Ice cores from Greenland pinpoint the year of the eruption to 536 CE, right in the middle of all the gold treasure discovered by amateur archaeologists in fields throughout Scandinavia. 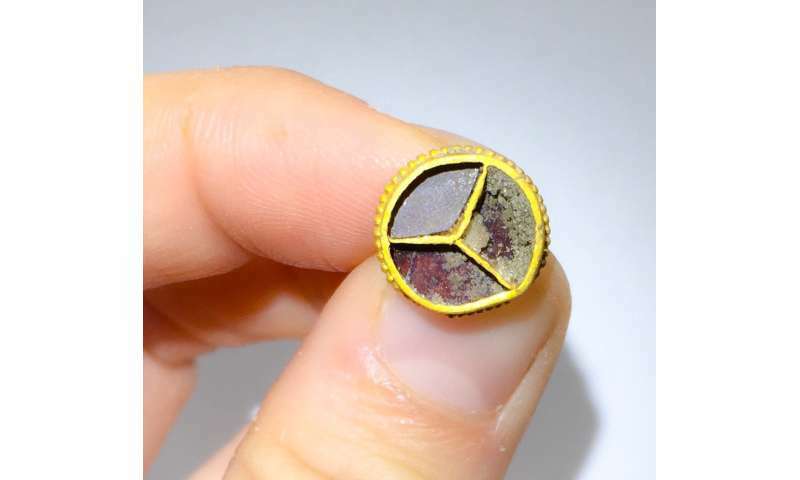 The most recent discovery was made by a pair of metal detectorists and amateur archaeologists in a field on the Danish island of Hjarnø, in Horsens Fjord. It was a spectacular discovery and an expensive one, containing more than 34 objects, 27 of which are pure gold. Forgotten treasure or a gift for the gods? Amateur archaeologist, Terese Refsgaard, alerted us to the discovery at Vejle Museums, in accordance with Danish law. And one of our first questions was whether the objects were buried together as treasure to be hidden, or whether it was intended as an offering to the gods. Treasure is buried in a hurry to hide it during times of threat or during a turbulent situation, and is often intended to be collected again once the threat has passed. But an offering is intended to remain buried as a gift to the gods. Sacrifices often contain a certain combination of objects, probably so that they can be used later on in Valhalla, as described in the Ynglinga saga. There are many indications that the recent Hjarnø discovery was such an offering. It contains women's jewellery, gold beads, and bracteates—thin gold discs with a small eyelet worn by women on a string or chain around their neck. They must have belonged to a rich woman of high social status. It also contained numerous small gold pieces that would have been used as a form of payment. The next question to answer was whether any more gold was hidden at the site? So, in late summer 2018, we started to excavate at the site of the Refsgaard's discovery, which was recorded by GPS. We slowly revealed the fine layers of earth and passed metal detectors over the site. We dug down to the subsoil where archaeologists often find post holes and other traces of past life. As we went, we discovered even more gold—more than double the amount originally discovered. This shows just how vulnerable the treasure has been over the years as it was not buried particularly deep. Throughout the following centuries of ploughing it's a wonder that it wasn't ploughed away entirely. It just goes to show how quickly relicts from the past can disappear. We could not see that the offering had been buried in a house, as is sometimes the case. So we think that it was a typical offering made in the hope that the gods could help those who buried the treasure through a difficult time. And we know that it dates to the 6th century. Was it intended to appease angry gods and end the poor summers and dark skies following the El Salvador volcanic eruption? Regardless of why the offering was made, it was surely buried by a man of high social status, perhaps a chieftain looking to demonstrate his power and influence to the gods. It certainly demonstrated that his wife was powerful enough that she could sacrifice all this gold and probably had more where that came from. In the same way that we today spend money on expensive cars that perhaps cost more than is necessary. 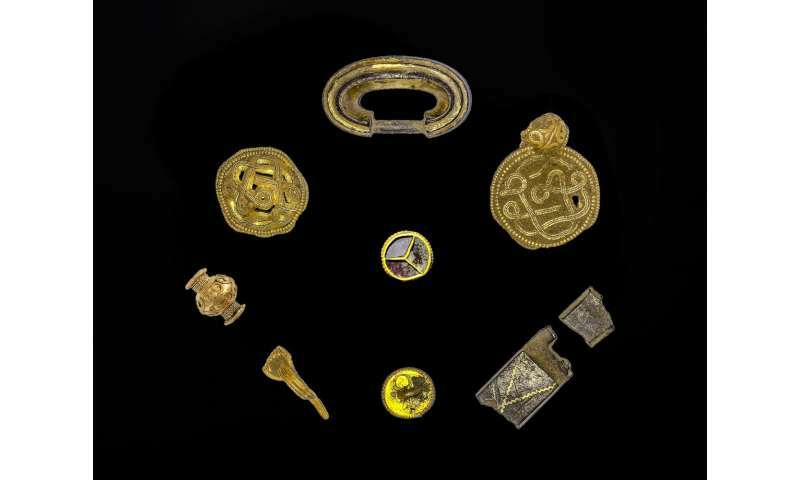 In the coming years, Vejle Museums will analyse the objects to discover where the gold came from, how it was made, who brought it to Denmark, and precisely why it was laid in the ground at Hjarnø looking out to sea. 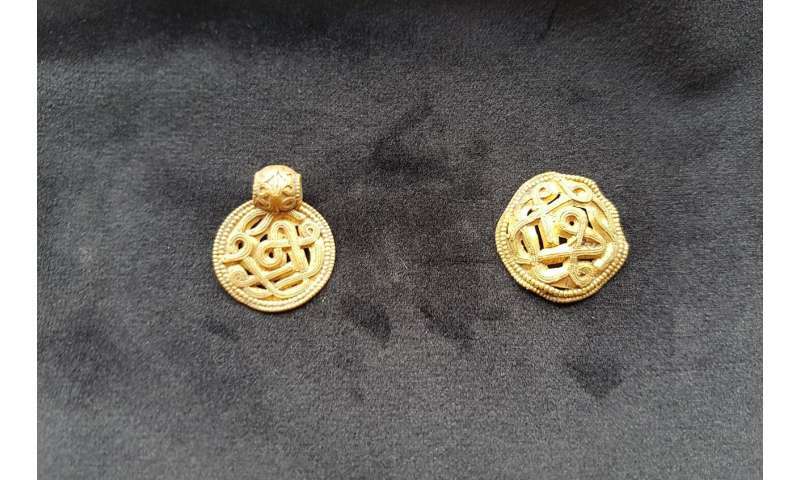 In the meantime, the gold is on display in Vejle at The Vejle Museums, Museum of Cultural History, from the end of January 2019. The question about plowing? The simplest answer was historically, farmers had crappy plows. That made only shallow furrows. Deep plowing wasn't really feasible, in general usage, until industrialization in the 19th century. With the development of steel plow blades and the switch from animal labor to mechanical. Also, cultivation lifts and loosens soil, making it vulnerable to erosion by wind and water. "Average rates of soil erosion under natural, non-cropped conditions have been documented to be less than 2 Mg ha−1 yr−1. On-site rates of erosion of lands under cultivation over large cropland areas, such as in the United States, have been documented to be on the order of 6 Mg ha−1 yr−1 or more. In northeastern China, lands that were brought into production during the last century are thought to have average rates of erosion over this large area of as much as 15 Mg ha−1 yr−1 or more. "